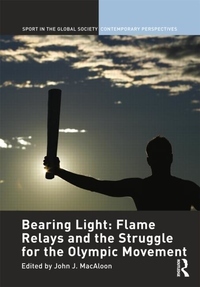 The Flame Relay and the Olympic Movement is the first book-length scholarly study in English of the contemporary Olympic flame relay. Reporting for the first time on years of intensive ethnographic research and organizational intervention, MacAloon literally follows the Olympic flame through twenty years of intercultural encounter, conflict, and negotiation. Focusing on the frequently harmonious, sometimes perilous encounters among Greek flame relay officials, cultural agents, and discourses, foreign Olympic Games organizing committees, and such transnational actors as the IOC and its corporate sponsors since 1984, a context is created for understanding the significance for the Olympic movement and for globalization studies of the 2004 Athens flame relay, the first to travel the entire world. Through intensive interviews and co-participations with leading Greek and American actors and the contributions of young Greek researchers who worked backstage on the relay, Bearing Light demonstrates how culturally parochial the managerial regime of "world's best practices" often turns out to be and yet how inescapable it has become for those who wish to communicate across cultural and political boundaries. This dilemma, the contributors argue, constitutes the practical form in which the struggle to preserve a sense of "Olympism" and "the Olympic Movement" against the demands and prerogatives of today's Olympic sports industry is being chiefly fought out.